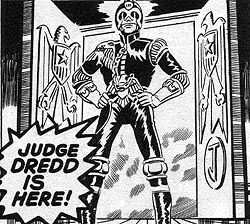 As you may well know, Rebellion (the owners of 2000AD) have been putting out a series of books showing, sequentially, all of Judge Dredds tales in 2000AD, from his debut in prog 2. I have recently had my interest reawakened in 2000AD, with the likes of Cradlegrave, and as a result, have wanted to revisit my youth and rediscover the Dredd tales of my youth, and continue it on from where I left off, which around 1989. I plan to do a review on each ‘Case File’ – I have 4 up to now – as and when they get read by me. This is my impression of the Complete Case Files 01. This initial title clearly shows the difficulty the creators and all the creatives had in finding a voice, tone and style for Dredd. 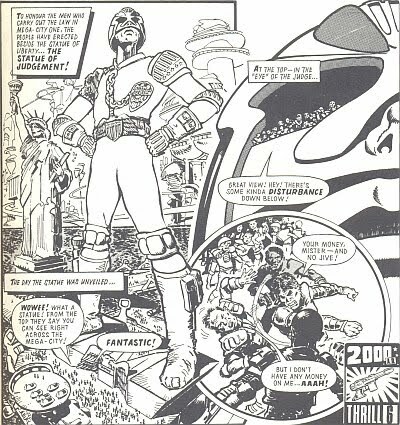 Within 5 years you have epic tales that are (justifiably) well remembered – tales like ‘The Apocalypse War’, and sooner than that you have other Dredd classics like ‘The Judge Child Quest’. Within a year or so of his debut, Dredd is taking vaccines across the irradiated wastelands of ‘The Cursed Earth’ on a desperate mercy mission. But unitl then, you have the early stuff. 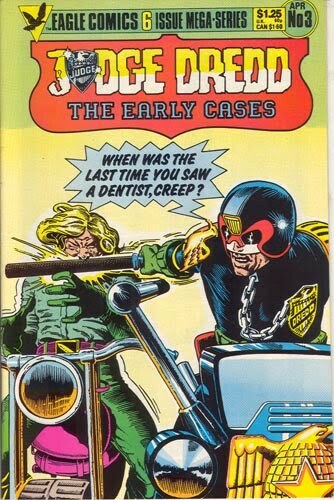 Let me burst the bubble – early Dredd is not that good. 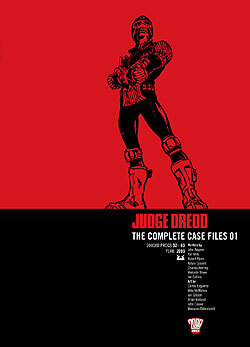 With some of the most laborious plotting (The Robot Wars – the proto Dredd ‘epic’ is just a one issue story streeeeetched over 6 issues, and boy does it feel like it) and lashings of poetic justice / ironic endings (an example – Criminals on the verge of killing Dredd getting struck down by a Sword wielded by a Statue representing Justice). Some of the endings can be telegraphed a mile off, and that makes the whole thing feel very corny in parts – because it is very corny in parts. Also, Maria (the astoundingly generic Italian Mama) the Housekeeper, and Walter the (bloody) Wobot are pointless and painful at times (and there are even some ‘Bonus’ Walter strips crafted by Brian Bolland towards the back of this book, not that they are really worth the time or effort). There is enough in this volume to keep you amused – there are some good tales here. There are Death Races (the Mega City 5000, with Bolland making his debut and a very different Spikes Harvey Rotten making his first appearance, prior to his makeover for the Cursed Earth storyline), Deadly Game Shows, Morris Minor Thieves (you see? 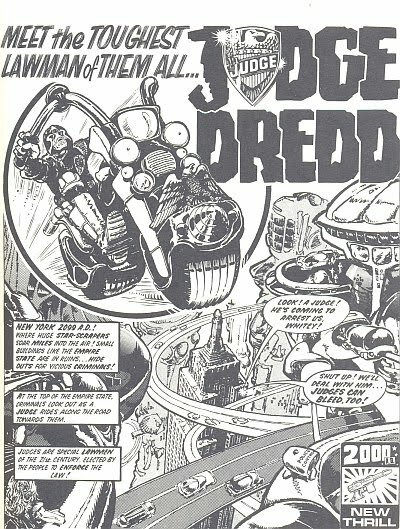 The Seventies produced Dredd and its all over these early strips) and (probably) the best story in the strip – the ‘Return of Rico’. And as I stated before, the art is stunning throughout. The book as a whole is well thought out, with some of Dredds covers from early 2000AD at the back of the book as a bonus. Of greater interest is the prototype Dredd adventure from 2000AD’s ‘issue zero’, entitled ‘Bank Raid’, where Dredds methods are brutal – he is literally a Judge, Jury and Executioner. The strips tone was altered ready for its debut in prog 2, but it is interesting to see what might have been – Mega City One would have been an even more brutal, unforgiving place.